Every year, I struggle with what to get dad for Father's Day. I am frugal by nature, and I hate paying full price, so the struggle doesn't always lie in WHAT to get him, but more about how to get it at the best price. This year, I was introduced to Promotionalcodes.com which offers hundreds of discount codes to my favorite retailers. 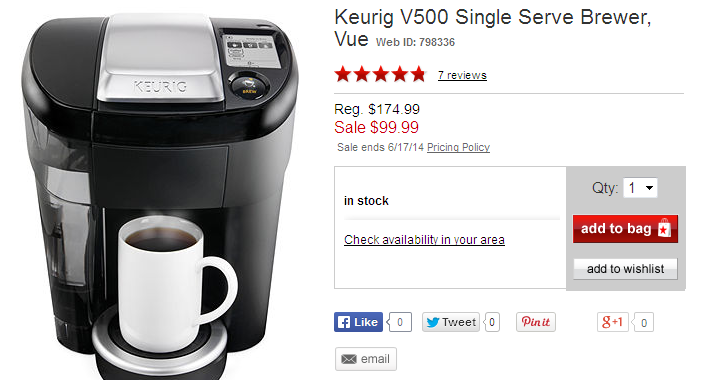 I decided to use the 20% off Macy's purchase to get my dad this really cool Keurig V500 which was on sale from $179.99 to just $99.99 PLUS the 20% off code, making it just $80 + FREE shipping! Other awesome retailers available on Promotionalcodes.com include Sears, Walmart, Amazon, Sunglass Hut..and so many more! If you check daily, you will see new sales and specials. Shopping on Promotionalcodes.com is so easy. First, go to Promotionalcodes.com and in the search bar at the top, choose the item or site you want the code for, then click to reveal the code on the offer you have chosen. I love that I can search by item, so when I was looking for a Keurig, I simply typed in Keurig and came up with all the stores offering the Keurig at a sale price, and looked until I found the best deal. It was so easy!